Download "Full Time - Temporary NTE - 13 months. 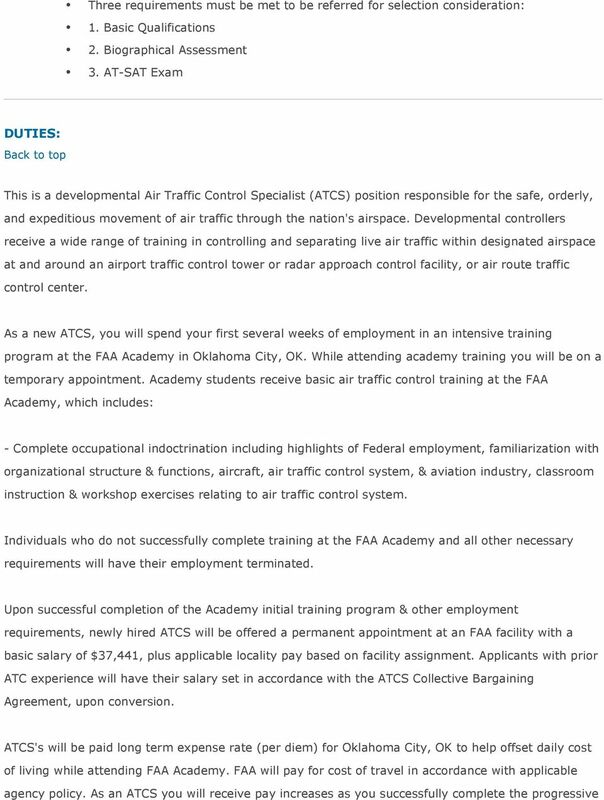 Many vacancies in the following location: FAA - Air Traffic Locations, United States U.S."
1 Job Title:Air Traffic Control Specialist - Trainee Department:Department Of Transportation Agency:Federal Aviation Administration Job Announcement Number:FAA-AMC-14-ALLSRCE SALARY RANGE: OPEN PERIOD: SERIES & GRADE: POSITION $20, to $27, / Per Year This salary includes locality pay which will be applicable while attending the FAA ATC Academy. 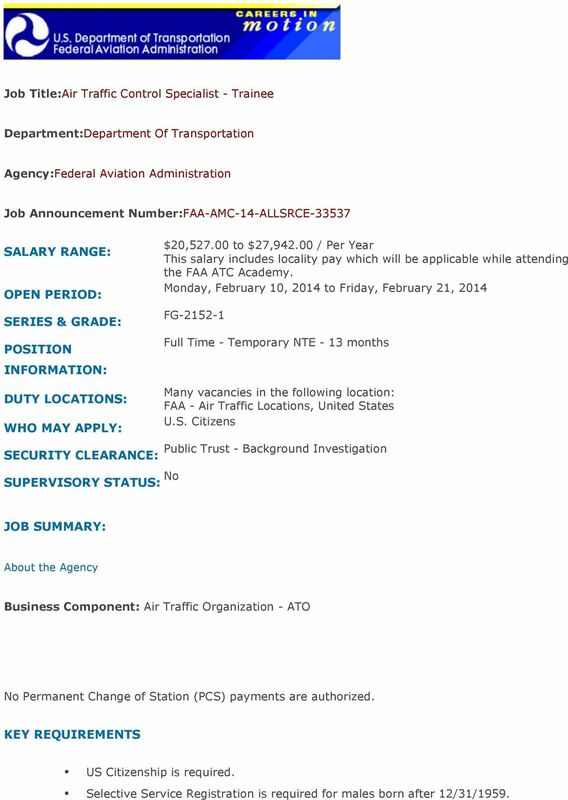 Monday, February 10, 2014 to Friday, February 21, 2014 FG Full Time - Temporary NTE - 13 months INFORMATION: DUTY LOCATIONS: WHO MAY APPLY: SECURITY CLEARANCE: Many vacancies in the following location: FAA - Air Traffic Locations, United States U.S. Citizens Public Trust - Background Investigation SUPERVISORY STATUS: No JOB SUMMARY: About the Agency Business Component: Air Traffic Organization - ATO No Permanent Change of Station (PCS) payments are authorized. KEY REQUIREMENTS US Citizenship is required. Selective Service Registration is required for males born after 12/31/1959. 4 the transcript which includes the name of the institution, quarter or semester hours earned and/or confer date. OR 3. TO QUALIFY BASED UPON THE COMBINATION OF BOTH WORK EXPERIENCE AND EDUCATION: The applicant's total qualifying experience is converted to a percentage of the experience required then the applicant's education is converted to a percentage of the education required. The combined percentages must equal 100%. At the undergraduate level, successfully completed education that has not led to possession of a degree is credited based on its relationship to 120 semester hours or 180 quarter hours. For example, 30 semester hours or 45 quarter hours is comparable to 1 year of undergraduate education. For study at a business or technical school, 36 weeks of study (20+ classroom hours per week) is comparable to 1 academic year above high school. OR 4. 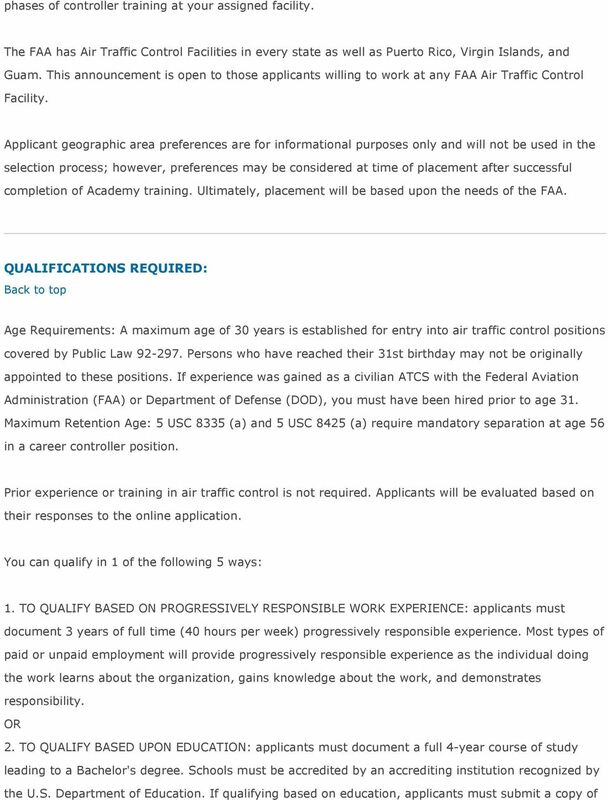 TO QUALIFY BASED ON SPECIALIZED WORK EXPERIENCE AS AN AIR TRAFFIC CONTROL SPECIALIST: applicants qualifying based on specialized experience must provide supporting documentation that verifies that this requirement has been met (e.g., FAA certificate, military certificate or training record). OR 5. TO QUALIFY BASED ON ALTERNATIVE REQUIREMENTS, applicants must provide supporting documentation that verifies at least one of the following alternative requirements being met: a. Do you hold or have held an appropriate facility rating and have actively controlled air traffic in civilian or military air traffic control terminals or centers? b. Do you hold or have held an FAA certificate as a dispatcher for an air carrier? c. Do you hold or have held an instrument flight rating? d. Do you hold or have held an FAA certificate as a navigator or have been fully qualified as a Navigator/Bombardier in the Armed Forces? e. Do you have 350 hours of flight time as a copilot or higher and hold or have held a private certificate or equivalent Armed Forces rating? f. Have you served as a rated Aerospace Defense Command Intercept Director? Successful candidates must be able to speak English clearly enough to be understood over radios, intercoms, and similar communications equipment. We are not accepting applications from noncitizens. 5 HOW YOU WILL BE EVALUATED: Applicants may be rated on the extent and quality of experience, education, and training relevant to the duties of the position(s). All answers provided in the on-line process must be substantiated. BENEFITS: Back to top You can review our benefits at: OTHER INFORMATION: We may use this vacancy to fill other similar vacant positions. Travel may be required. Position may be subject to a background investigation. A one-year probationary period may be required. 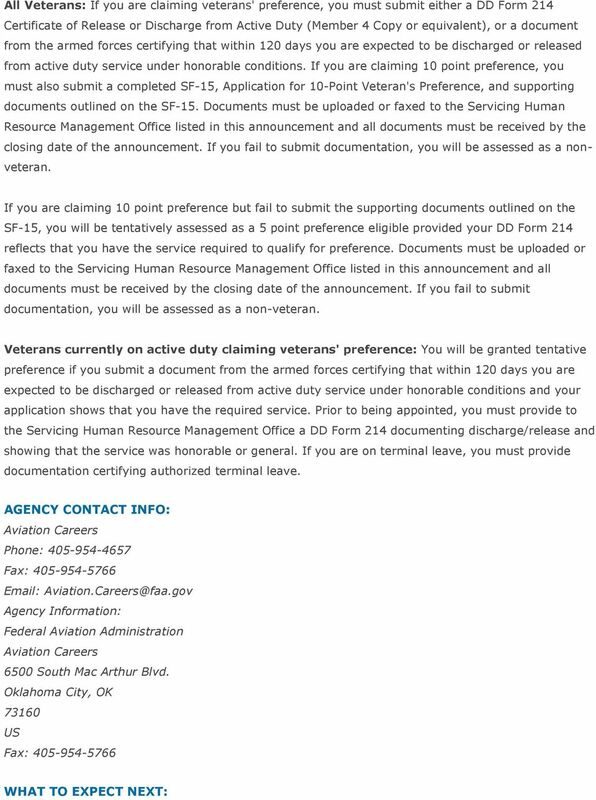 The person selected for this position may be required to file a financial disclosure statement within 30 days of entry on duty. FAA policy limits certain outside employment and financial investments in aviation-related companies. 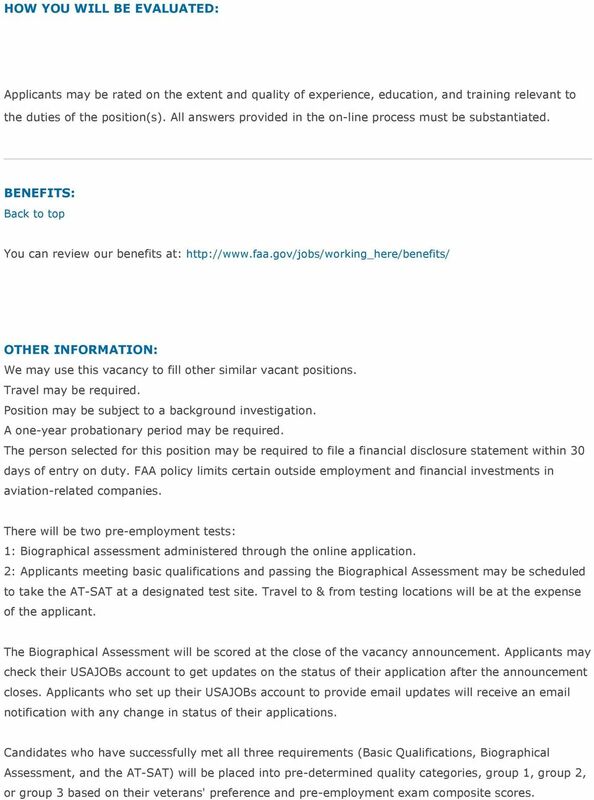 There will be two pre-employment tests: 1: Biographical assessment administered through the online application. 2: Applicants meeting basic qualifications and passing the Biographical Assessment may be scheduled to take the AT-SAT at a designated test site. Travel to & from testing locations will be at the expense of the applicant. The Biographical Assessment will be scored at the close of the vacancy announcement. Applicants may check their USAJOBs account to get updates on the status of their application after the announcement closes. Applicants who set up their USAJOBs account to provide updates will receive an notification with any change in status of their applications. Candidates who have successfully met all three requirements (Basic Qualifications, Biographical Assessment, and the AT-SAT) will be placed into pre-determined quality categories, group 1, group 2, or group 3 based on their veterans' preference and pre-employment exam composite scores. 6 Requirement for pre-employment medical clearance: Applicants selected for ATCS positions must pass a medical examination that includes psychological screening prior to appointment. Applicants with prior military service are encouraged to obtain a sealed copy of their military medical records prior to discharge and to retain these records to be provided upon request if selected. Requirement for security clearance: This position requires an Access National Agency Check and Inquiry with Credit (ANACI) or higher prior to appointment unless a waiver is obtained. 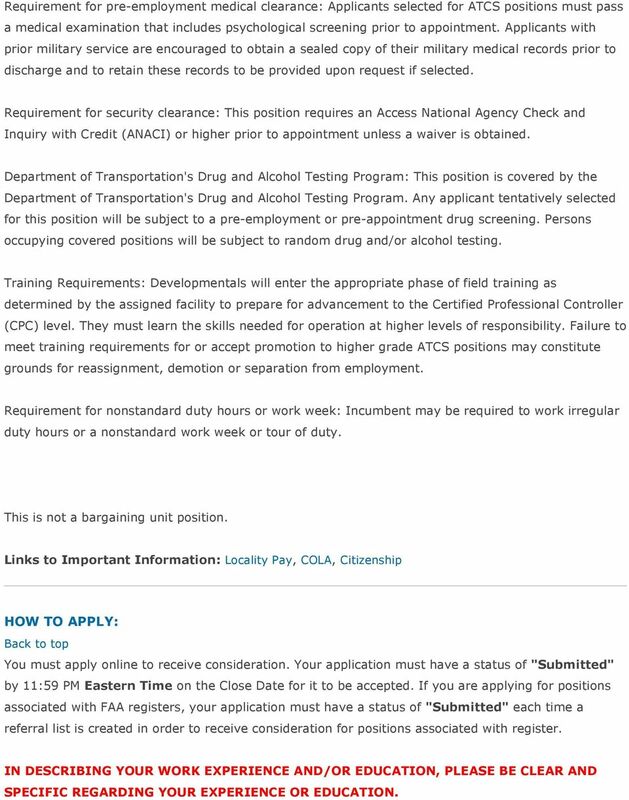 Department of Transportation's Drug and Alcohol Testing Program: This position is covered by the Department of Transportation's Drug and Alcohol Testing Program. Any applicant tentatively selected for this position will be subject to a pre-employment or pre-appointment drug screening. Persons occupying covered positions will be subject to random drug and/or alcohol testing. Training Requirements: Developmentals will enter the appropriate phase of field training as determined by the assigned facility to prepare for advancement to the Certified Professional Controller (CPC) level. They must learn the skills needed for operation at higher levels of responsibility. Failure to meet training requirements for or accept promotion to higher grade ATCS positions may constitute grounds for reassignment, demotion or separation from employment. Requirement for nonstandard duty hours or work week: Incumbent may be required to work irregular duty hours or a nonstandard work week or tour of duty. This is not a bargaining unit position. Links to Important Information: Locality Pay, COLA, Citizenship HOW TO APPLY: Back to top You must apply online to receive consideration. Your application must have a status of "Submitted" by 11:59 PM Eastern Time on the Close Date for it to be accepted. If you are applying for positions associated with FAA registers, your application must have a status of "Submitted" each time a referral list is created in order to receive consideration for positions associated with register. IN DESCRIBING YOUR WORK EXPERIENCE AND/OR EDUCATION, PLEASE BE CLEAR AND SPECIFIC REGARDING YOUR EXPERIENCE OR EDUCATION. 7 We strongly encourage applicants to utilize the USAJOBS resume builder in the creation of resumes. Please ensure EACH work history includes ALL of the following information: Job Title (include series and grade if Federal Job) Duties (be specific in describing your duties) Employer's name and address Supervisor name and phone number Start and end dates including month, day and year (e.g. June to April ) Full-time or part-time status (include hours worked per week) Salary Determining length of General or Specialized Experience is dependent on the above information and failure to provide ALL of this information may result in a finding of ineligible. You may upload completed documents to your USAJOBS Account. This will provide you the opportunity to utilize the uploaded information again when applying for future vacancies. Please see this guide, Document Upload Guide, for more information on uploading and reusing the documents in your applications. 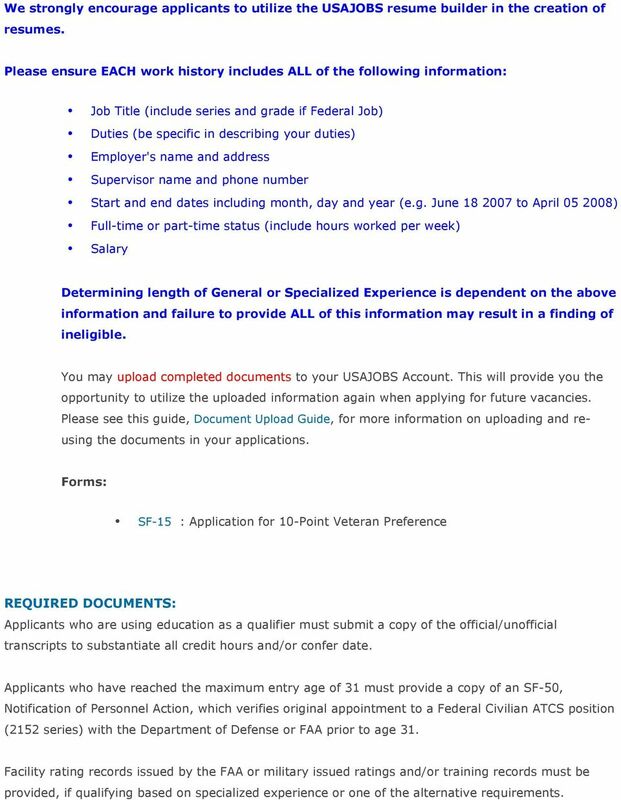 Forms: SF-15 : Application for 10-Point Veteran Preference REQUIRED DOCUMENTS: Applicants who are using education as a qualifier must submit a copy of the official/unofficial transcripts to substantiate all credit hours and/or confer date. 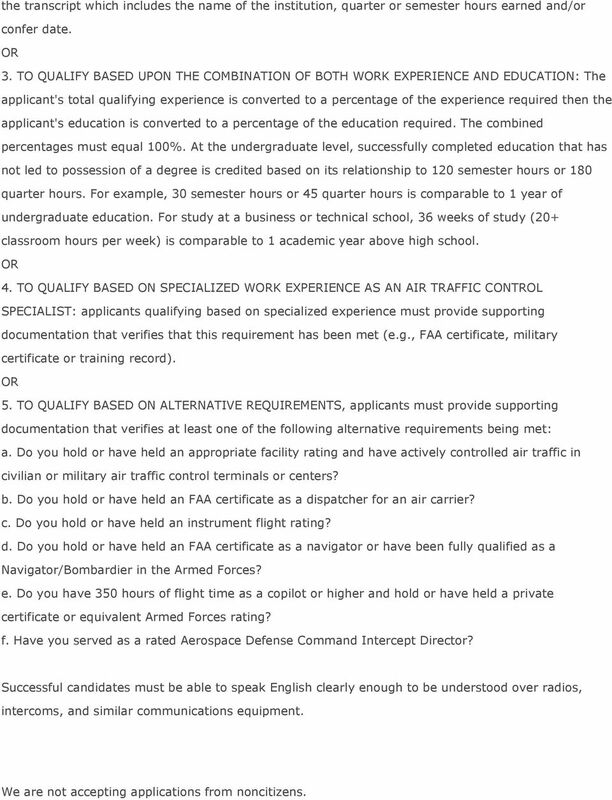 Applicants who have reached the maximum entry age of 31 must provide a copy of an SF-50, Notification of Personnel Action, which verifies original appointment to a Federal Civilian ATCS position (2152 series) with the Department of Defense or FAA prior to age 31. Facility rating records issued by the FAA or military issued ratings and/or training records must be provided, if qualifying based on specialized experience or one of the alternative requirements. 9 Candidates for FAA positions are evaluated using our Automated Vacancy Information Access Tool for Online Referral (AVIATOR) system. AVIATOR compares your skills and experience as described in your application with the requirements of the position. If you are found to be an eligible, highly-qualified candidate, you will be referred to the selecting official for further consideration. (In some cases, individuals with priority for special consideration must be considered and selected before other candidates.) Whether or not you are contacted for an interview depends upon the location of the position and the judgment of the selecting official. Important - If you make any change to your application, you must resubmit it. If you change your application and do not resubmit it, your changes will not be considered part of your application package, and your previous application will be considered. 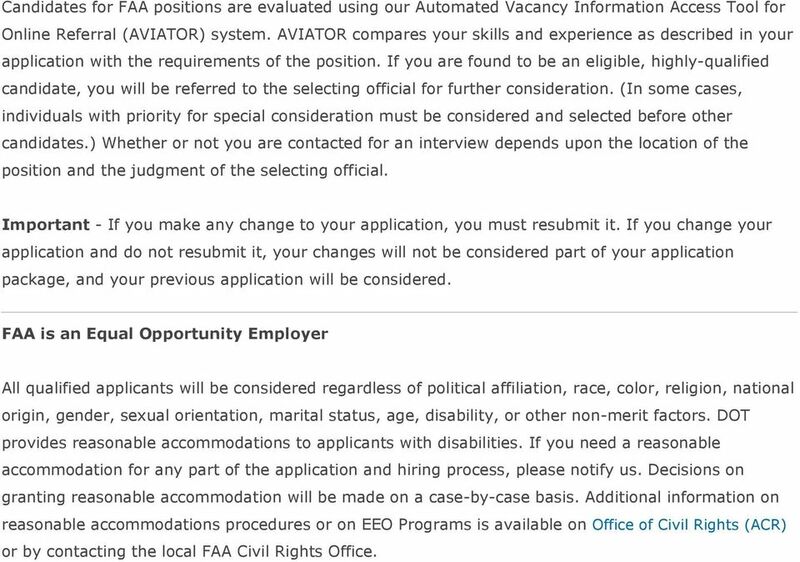 FAA is an Equal Opportunity Employer All qualified applicants will be considered regardless of political affiliation, race, color, religion, national origin, gender, sexual orientation, marital status, age, disability, or other non-merit factors. DOT provides reasonable accommodations to applicants with disabilities. If you need a reasonable accommodation for any part of the application and hiring process, please notify us. Decisions on granting reasonable accommodation will be made on a case-by-case basis. Additional information on reasonable accommodations procedures or on EEO Programs is available on Office of Civil Rights (ACR) or by contacting the local FAA Civil Rights Office. All qualified applications received by March 9, 2016 will be on the first list referred to the selecting official.